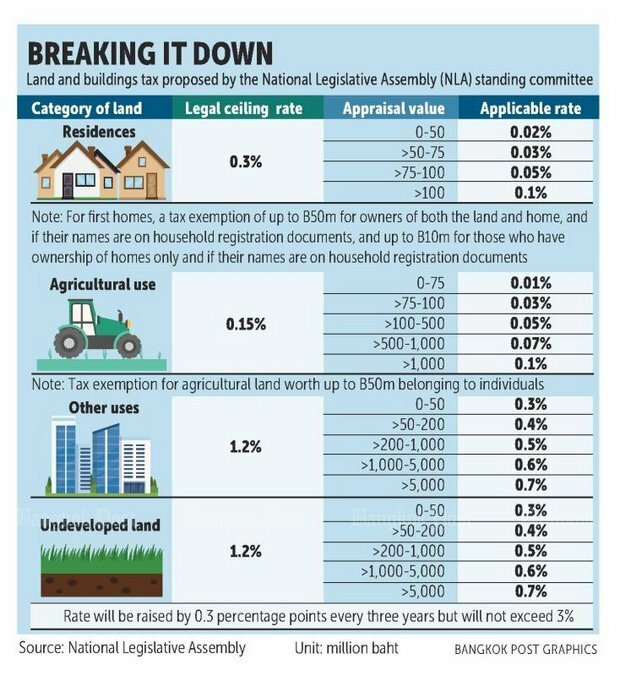 The National Legislative Assembly (NLA) on Friday passed the long-delayed bill on land and building tax, which will become law after it is published in the Royal Gazette. The bill cruised through the second and third readings, each by 169-0 votes and three abstentions. Its final passge ended the long legislative process since it entered the NLA for the first reading in March last year. Deputy Finance Minister Wisudhi Srisuphan, who chaired the committee vetting the bill, thanked all legislators for their support and said it will boost the economy and bring the tax structure up to international standard. On Thursday, he said it would also help boost effective use of land and inject more money into local administrative organisations for local development. The 94-section bill was deliberated by the NLA on Thursday. It will replace the house and land tax and the local development tax, which have drawn criticism for being outdated.